Supplemental examinations Supplemental examination in biology and environmental sciences is required before admission to the study programme if this subject was not completed satisfactorily with at least 6 credit hours at a higher-level secondary school ("Oberstufe"). Supplemental examination in Latin is required before completion of the bachelor's degree programme if this subject was not completed satisfactorily with at least 10 credit hours at a higher-level secondary school. 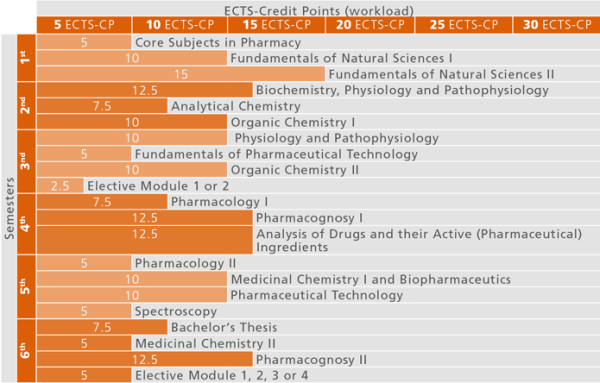 General Chemistry for Students of Pharmacy (CM3a, VO4, 8 ECTS-Credits). (2) Successful passing of all exams of the Studies Induction and Orientation Period entitles to passing all further courses and examinations and to writing the Bachelor’s Thesis. (3) Before successful completion of the Studies Induction and Orientation Period lectures (VO) and lectures with practical elements (VU) amounting to 10 ECTS-Credits may be passed. The registration requirements listed in the curriculum must be met. The goal of the Bachelor’s Programme Pharmacy at the University of Innsbruck is to convey fundamental scientific skills and methods in the main fields of pharmacy as well as associated fields. The Bachelor’s Programme Pharmacy leads to a first professional university degree which enables to qualified activities in the pharmaceutical industry, at universities, other research institutions or testing facilities. Graduates of the Bachelor’s Programme Pharmacy possess fundamental theoretic and practical knowledge of the de-velopment, production and quality control of pharmaceuticals and medicines, and they have basic knowledge of the methods of neighbouring subject areas, such as physics, biochemistry, biotechnol-ogy, microbiology and hygiene. Graduates of the Bachelor’s Programme Pharmacy at the University of Innsbruck have the nec-essary basic skills for a career start in this field, e.g. in analytical or diagnostic laboratories or in the pharmaceutical industry.